The North Pennines is a special place, providing excellent habitats for a wide range of important wildlife. The landscape has the highest density of breeding waders in mainland UK and more than 80% of England’s black grouse. As a result, the area has huge potential to help boost populations of nationally declining upland birds including lapwings, curlews and black grouse. In the North Pennine Dales, the RSPB are working with farmers and land managers to enhance farm wildlife, concentrating on five dales; the Allen Valleys, Baldersdale, Lunedale and Upper Teesdale. Funds from a Teesdale man’s legacy are being used to create habitats for breeding waders and black grouse, by controlling areas of dense soft rush and creating scrapes for breeding waders, and planting small areas with trees for black grouse. Thomas Raine originally came from Teesdale and always regarded the area as “God’s own country”. He very generously left some money in his will to the Campaign for the Protection of Rural England (CPRE) to help protect the area he loved. The Durham Branch of CPRE decided that it would be appropriate to spend some of the legacy by helping the RSPB to increase the amount of wildlife-rich habitat on farmland in the area. As a result, the RSPB have been working with three farms in Baldersdale and Lunedale. On these farms, we have funded the cost of hiring a local contractor to control dense soft rush in fields that will be suitable for breeding waders once the rush cover has been significantly reduced. Soft rush (Juncus effusus) is an important aspect of the upland landscape. It provides shelter for stock, particularly young lambs, and is an important habitat for various birds, invertebrates and insects. Traditionally, soft rush stems were soaked in fat and used in household lamps as wicks, as it was a cheaper alternative to candlelight. This practice was revived during the Second World War in some rural areas. Unfortunately, soft rush can also be invasive and troublesome. It spreads by rhizomes (underground plant stems capable of producing the shoot and root systems of a new plant) and each seed head can produce more than 8,000 seeds every year, which can remain dormant within the soil for at least 20 years until the conditions are right for them to germinate. It can spread rapidly to form extensive, dense stands, and is tough and waxy so most livestock will avoid eating it. Once a soft rush infestation covers more than a third of a field, the value of that field is significantly reduced for both breeding waders and grazing livestock. There are several methods for controlling soft rush, the main ones being cutting, herbicides, grazing and re-seeding. Sometimes a combination of several techniques is utilised. The choice will be influenced by a range of factors such as the topography, botanical diversity, ground conditions, cost and proposed management after control. In the lowlands, rush is often managed using a combination of cutting in late summer, followed by weed wiping with herbicide 4-6 weeks afterwards. In the uplands however, plants grow much slower and we do not get enough rush re-growth following cutting to be able to follow up with weed wiping before the end of the growing season. Up here in the hills, we therefore weed wipe without cutting the rush first. This method is proving to be successful in the North Pennines. The weed wiper is towed behind a quad bike, and has a rotating brush which is set to such a height that it applies the herbicide directly to the rush stem. This enables us to control the rush without damaging the grass or any botanical diversity in the field. Just four weeks after weed wiping, the soft rush has started to die off. We have funded weed wiping on about 32ha of soft rush across the three farms this autumn and are planning to monitor the success of this work by carrying out breeding waders surveys next spring. Now that the 2014 rush control work has been completed, we are talking to farmers in the area about using the remaining legacy money to fund some more habitat creation. We are currently preparing to plant a small area of scattered trees on a farm in Baldersdale for black grouse this winter, and will be on the look out for a suitable site to create some scrapes next year. The family has owned the farm since 1907, and we brought management back ‘in-house’ in the 1960s. We converted to organic status over a ten year period from about 1982 and continued as a mixed farm until 2006, when we decided to become purely a livestock enterprise. We now farm around 100 South Devon suckler cows and 400 North of England mules. We aim for a simple, extensive meat production system, which suits the natural capacity of the land and its conservation. 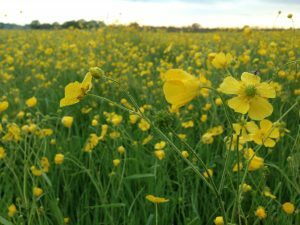 The farm has a 26ha flood meadow which includes both a Site of Special Scientific Interest (SSSI) and a Local Wildlife Site (LWS), as well as some undesignated land. 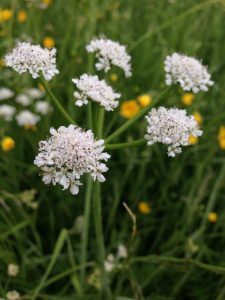 The SSSI was originally designated for a rare water snail but has since been re-designated as being a nationally important site for narrow-leaved water dropwort. The site has also been used for many years by breeding curlew and over wintering snipe. Although we are obliged to manage the SSSI to benefit the wetland flora, it also fits with the way we want to run the farm. We shut the water meadow up for hay over the early summer, which suits the curlew and allows the plants to flower fully. The hay cut provides forage over winter, and the cattle are turned onto the meadow to graze the aftermath. We created shallow footdrains in the field a couple of years ago to allow us to keep a bit more water on the field over the spring for waders. They’re all long, thin features though, so we can still get round and cut the hay without too much difficulty. We’ve been able to get support from Natural England when it comes to the SSSI and our agri-environment schemes. The RSPB have been surveying the waders in the area every year and helped plan and create the footdrains with their specialist rotary ditcher. We’ve also used advice from an independent consultant when it came to applying for some of the agri-environment grants, which was really helpful. When the water meadow was originally designated as a SSSI, it had had a bit of fertiliser and some drainage to improve the grassland for grazing. The change to managing it for hay with no artificial fertilisers has improved its condition for its rare plants, and allowed the water dropwort to flourish. The meadow is flooded every winter by the River Cherwell that borders it, but it can be hard to get the balance between getting enough wet edge for the waders in spring, and making the sure the soil across the field doesn’t stay waterlogged too long. Having the water features as long, thin footdrains should help with this to some degree. We are starting to get some lesser pond sedge forming a patch in one area, which could be tricky to control if it spreads much further. We have also noticed quite a lot of marsh ragwort starting to appear between the footdrains, which is causing us a little concern. There have been a couple of very wet summers recently that have meant we haven’t been able to cut the hay at all. In the short term it’s not ideal for either the farm, or for the wildlife, but I think it recovers after a couple of kinder years. We control the drainage of the foot drains back into the river via a very simple angle-bend. The original structure has been leaking a bit though, so we’re planning on replacing it with a better sluice. We take at least 150 tonnes of forage from it in a typical year, which protects us a bit from the variability of buying winter feed in. We do have to keep an eye on the quality though; the water dropwort is particularly special to this farm, but we worry how much it affects the health of the cows if they eat too much of it. The narrow-leaved water dropwort has definitely benefitted from the hay cut and wetter conditions. 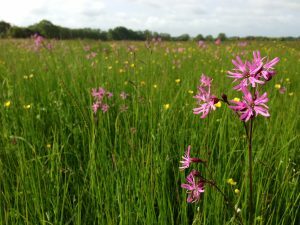 The meadow puts on an amazing wildflower display in the spring – early on it is a sea of ladies smock, then later a riot of yellow buttercups and pink ragged robin. I’m so pleased we’ve been able to support the curlew in this part of the river valley. Hearing the first one of the year has always been one of my favourite childhood memories growing up here, and it’s still a bit of a magical moment each February when they return. Another special bird that has enjoyed the meadow management is the barn owl. Following a reintroduction years ago (when it was still allowed under license), we now have three pairs on the farm. The nest site next to the meadow has been in use for 20 years, and they usually raise a good number of chicks on our local voles. My tip would be to enjoy it – if I get a quiet moment, I like sitting out on the hill overlooking the meadow. It’s a great vantage point to take in the view and the sounds of curlew, sedge warblers and reed buntings below. Also, buy some waders!